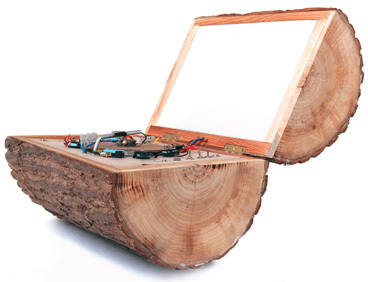 And, as if that weren't strange enough, the same team of Simon Blackmore and Antony Hall has created an instrument out of a lathe (scroll down to see it), with sensors to pick up the sounds of woodworking. Quoth Hall and Blackmore: "From a practical point of view, the lathe can easily produce truly round objects." Something that cannot be said of the latest USB keyboards from Edirol.